I recently shared with you guys I haven't had a relaxer in about three months and I'm currently working on getting some much needed moisture into my hair. 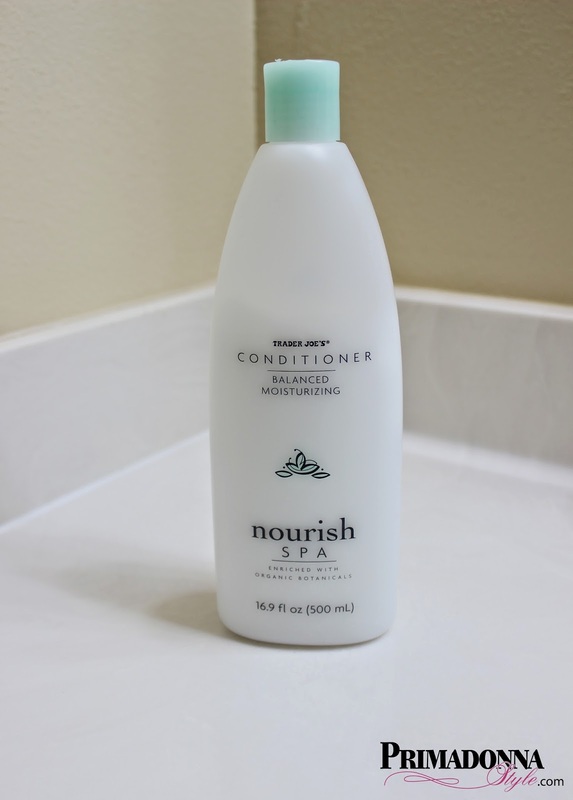 I decided to finally try Trader Joes' Nourish Spa Balance Moisturizing Conditioner as a part of my weekly wash regimen. Guys, this stuff is THE TRUTH. After shampooing and rinsing, I rubbed a bit through my hair while in the shower, and it was simply amazing... my hair instantly became softer, and I was able to finger detangle without issue all while in the shower. Now this many not sound like a bit deal to some, but I have NEVER, EVER been able to detangle my hair without some heavy duty conditioner, a large tooth comb, and a whole lot of patience (of which I typically do not have). In the recent months, even with a fresh relaxer, I couldn't just comb through my wet hair without a fight, and a whole lot of shed hair, so to be able to FINGER DETANGLE in the shower was simply amazing. When I rinsed out the conditioner and hopped out the shower I was able to grab my wide tooth comb and run it through my hair easily. I wish I would have found this product years ago; I probably would have saved myself a lot of shed hair and frustration. I hear if you have a Trader Joe's nearby you can grab it locally, but if you are like me and have no Trader Joe's around where you live you can order it here. Have you tried any Trader Joe's products? Share your experiences in the comments section.